Built on Panasonic’s high performance imaging platform, the Panasonic WV-SFV781L features a highly responsive 12 megapixel 4K ULTRA HD sensor that produces a 12MP image at 15fps and a 4K2K image at 30fps for incredibly high resolution at standard frame rates. Panasonic WV-SFV781L enhanced resolution of True 4K can cover a four times wider view compared to a 1080p full HD camera, and a nine times wider view compared to a 720p HD camera. In addition, True 4K cameras set a new standard for low-light performance, offering high-sensitivity in color at less than 0.3 lux illumination. Further, a built-in SmartIR-LED -ensures solid low-light performance in 0 lux environments. The Panasonic WV-SFV781L True 4K line features a new custom, 4K ready 6X optical zoom lens featuring a generous 17 to 100 degree field of view that meets the demanding resolution requirements of True 4K. 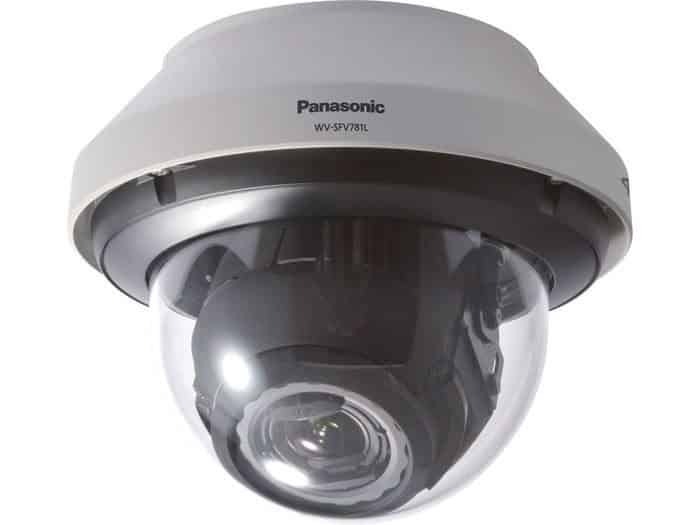 Other features include IK10 vandal-proof housing for both models and Panasonic’s water-resistant ClearSight™ Dome coating on the dome camera (WV-SFV781L) to ensure better visibility and viewing even in wet and moist conditions. Angular field of view H: 17-96 deg. V: 9.3-54 deg.